Come and learn more about the foreclosure process from attorneys handling foreclosures everyday. Whether you buy notes or buy property at foreclosure sales; this class is for you. Come and learn more about the foreclosure process from attorneys handling foreclosures everyday. 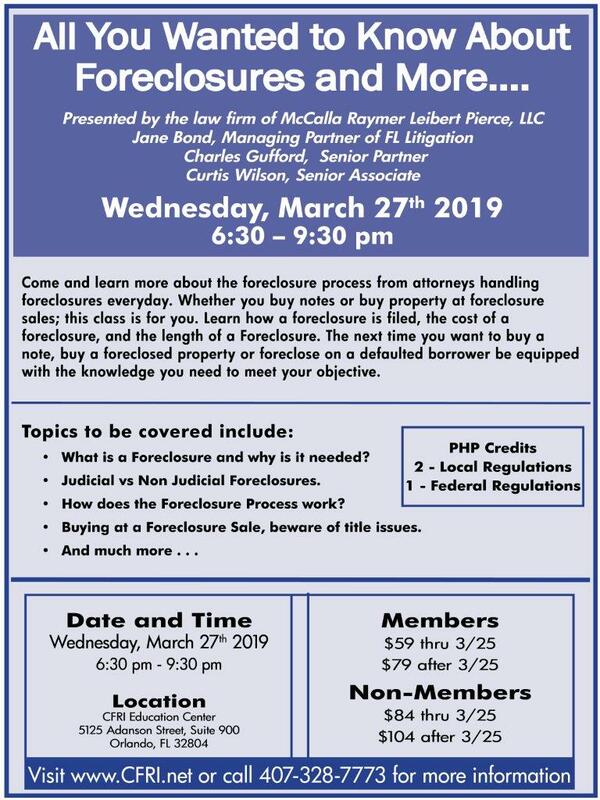 Whether you buy notes or buy property at foreclosure sales; this class is for you. Learn how a foreclosure is filed, the cost of a foreclosure, and the length of a Foreclosure. The next time you want to buy a note, buy a foreclosed property or foreclose on a defaulted borrower be equipped with the knowledge you need to meet your objective. • What is a Foreclosure and why is it needed? • Judicial vs Non Judicial Foreclosures. • How does the Foreclosure Process work? • Buying at a Foreclosure Sale, beware of title issues.